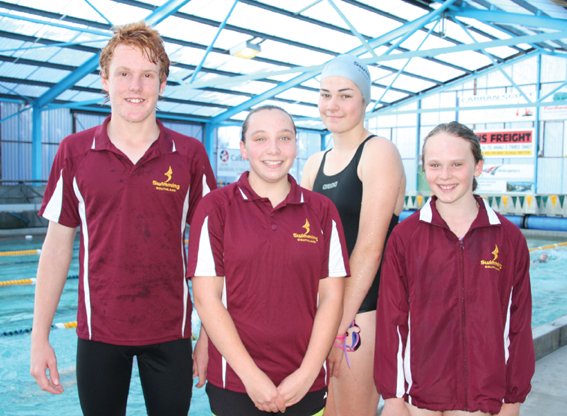 Four young swimmers from Fiordland Amateur Swimming Club - Bailey Taylor (14), Fern Calder (14), Franki Campbell (13) and Brooklyn Day (11) - took part in the South Island Town and Country competition in Blenheim (23-24 Feb). Three came home with 10 PB’s between them, a great achievement for a small club. To compete in events in the Town and Country meet they need to meet a qualifying time. If any have a faster time than this criteria they cannot compete as it is a Division II time. This happened to Bailey who was in this category with his best stroke, Butterfly, unable to compete at the meet. Bailey has swum in the Town and Country the past two years but first time for Fern, Franki and Brooklyn. Bailey swam in 13-14 year Boys 100 and 200 Individual Medley - 50 and 100 Breast - 50 and 100 Free – Relay Team 200 Free and 200 Medley. Bailey achieved 5 PB in 100 Individual Medley, 50 and 100 Breast, 50 and Free. He was also placed third in his 50 Breast event. Fern was in 13-14 year Girls in 50m Back, 100 Individual Medley, 50 Fly and 50 Free. Franki in the 13-14 year Girls 50 Back, 100m Individual Medley, 50 and 100 Breast, 100m Free as well as the Southland Relay team for 200m Free and 200m Medley. She achieved 4 PB’s in her 50 Back, 100 Individual Medley, 50 and 100 Free. Brooklyn swam in 11-12 Girls 50 and 100 Back, 100 Individual Medley, 50 and 100 Free as well as the 11-12 relay team for 200 Free and 200 Medley, with a PB in her 100m Back. The event attracted a growing number of participants bringing 250 swimmers from all over the South Island, up from 201 in Invercargill last year. The youngest swimmer there was 8 years, competing in the 10 & U section. It was noted on the great support for this year’s meet as well as the high percentage of personal bests achieved from the swimmers from all clubs. The swimmers obviously enjoyed the fast water, good competition and great atmosphere making it a fantastic event, the Organising Committee said. The meet provides an opportunity for swimmers who have not qualified for higher level national meets to qualify against swimmers from other South Island clubs.